Located in Chappaqua, NY, we have been serving both our furry and non-furry friends for over 20 years! Learn more about our extensive dog grooming services. From the shampoo to trim process, we make sure your pup is taken care of every step of the way. 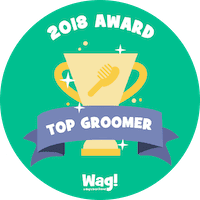 Looking to make an appointment for your dog's next grooming? Simply visit our booking page here to see when our next availability is. Book online today! At Wags & Whiskers we have lots of adorable friends. Check out just a few of our friendly buddies both before and after their trip to Wags for a grooming. Wags & Whiskers also stocks its shop with the industry's top quality care products for your dog. From shampoo to leashes and toys!